As a graphic designer you may prefer to use Illustrator, CorelDraw or any number of Illustrator Alternatives to trace your Bitmap images in to Vector ones. 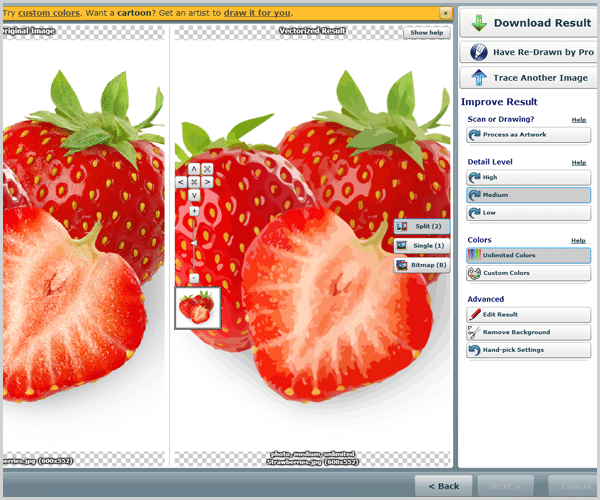 Vector Magic Review aims at throwing light on an online application which can be used to trace Bitmap to Vector. Personally I use the pen tool to convert Bitmap to Vector, but occasionally I use the Auto trace options for simple bitmap tracing in these applications, to save time and effort. But usually this auto-trace process would involve reshaping and re-coloring certain parts of the resulting vector. I have occasionally heard about the capabilities of Vector Magic from fellow designers and have read about it more than a couple of times. So I was eager to review its online application for quite some time. 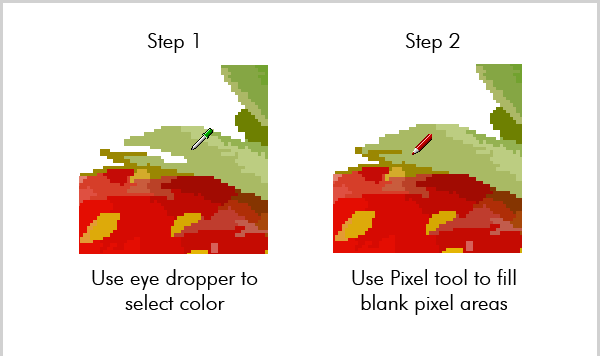 Another reason for writing a Vector Magic Review is that it’s an online tool, so I thought it would be helpful for a person looking to do an occasional Bitmap to vector conversion. 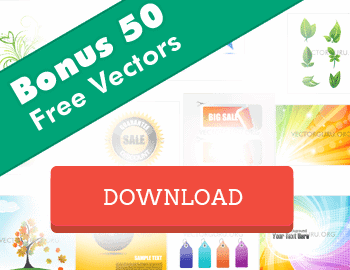 It may also be beneficial for someone who does not have access to proprietary Vector Applications such as Illustrator or CorelDraw. 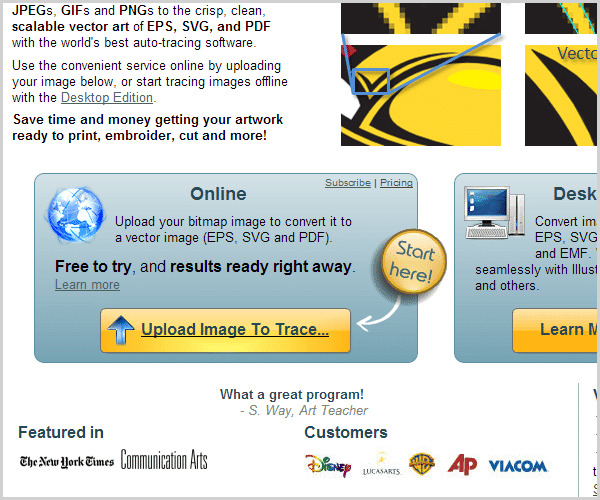 Vector Magic calls its application the world’s best auto trace application. So let’s move on with the Vector Magic Review and test its online version to see if it really fits the bill. We shall base our Vector Magic Review on important factors outlined below. 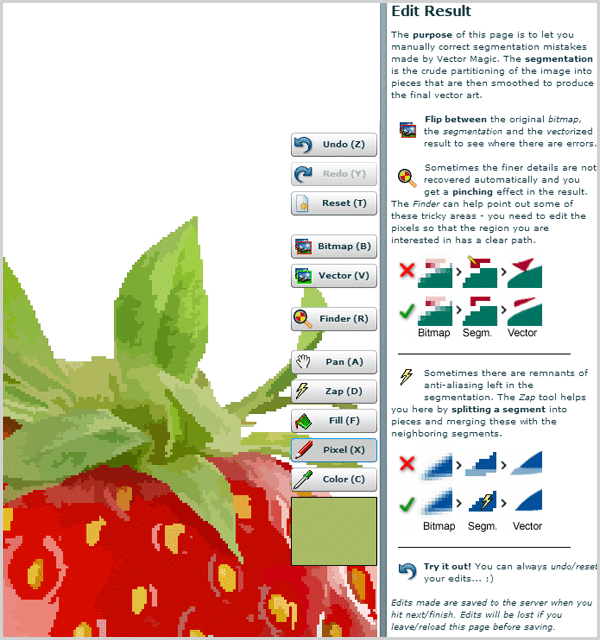 I am using an image of strawberries from Fotolia, a Stock Image website which offers high quality stock images. 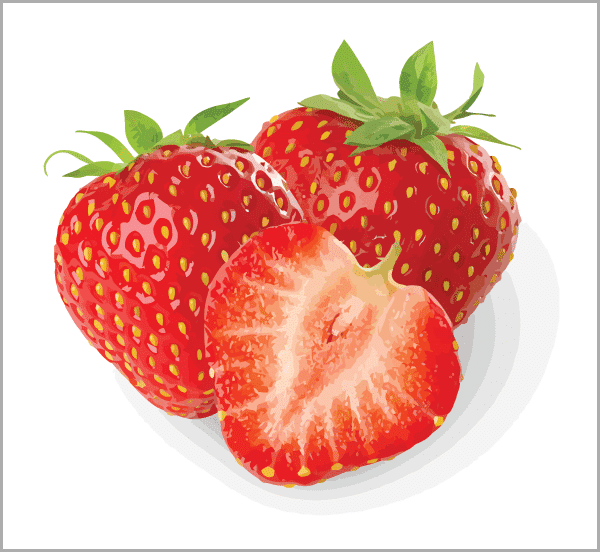 I have chosen this image for our Vector Magic Review as it has a good amount of detailing- some gloss, light shadows and fine texture in the half cut strawberry. Let us test to see if all these details remain intact in the resulting Vector image. Uploading this image on Vector Magic is fairly simple. 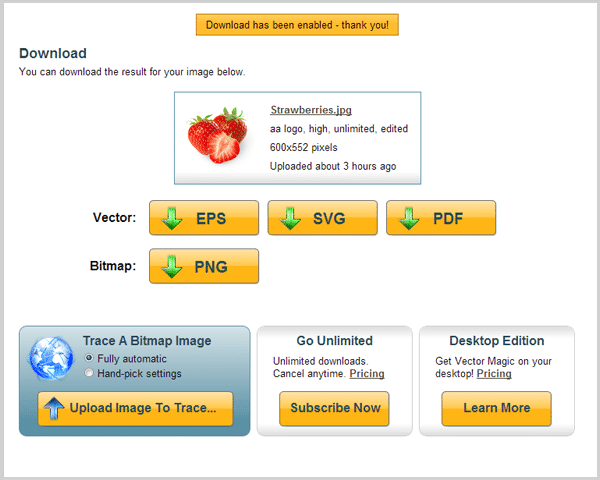 Steps for uploading – Go to VectorMagic.com, Login or Create a new Account by filling in the details and finally you can Browse and Upload image to be traced. The upload time is amazingly quick. Once the Bitmap is uploaded, Vector Magic begins tracing the image and shows the result almost instantly. The default Vector result is astounding. I am already pleased, but let’s explore and see what else we have in store. An Overview of the Options. The ‘Improve Result’ section in the sidebar gives you options based on the level of detail that is required in your resulting Vector – High, Medium and Low. Besides these options you also get to choose the colors in case you want to reduce the range of colors in the output or swap certain colors for different results. The Advanced category in this section helps you further enhance your results by providing additional editing tools. A remove background tab which may help you delete the background immediately and some advanced hand-picked settings for fine granular control over the result. We shall look into these features and its performance in the next section. Let’s check these settings out one by one to understand the capabilities of Vector Magic better. Honestly I wasn't pleased with the low detail trace. You would agree if you see the edge shapes failing in many places, making it look jagged and broken. But even though it’s a low detailed trace it certainly does a fair job of keeping the colors in place. 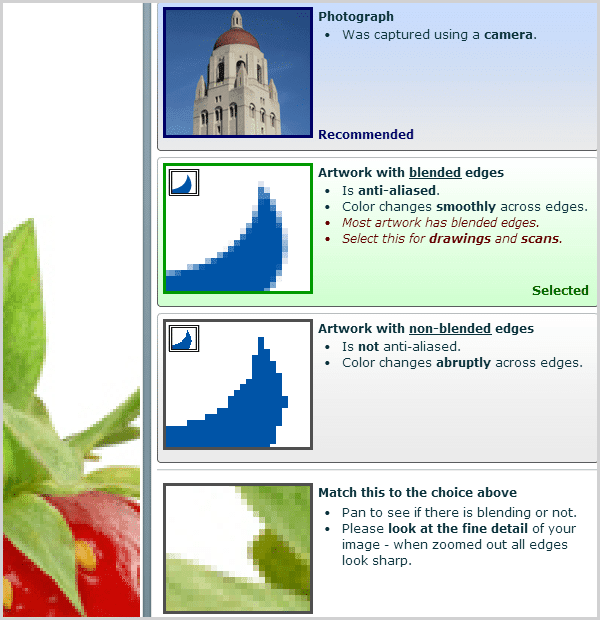 You would want to vote this option out, unless you are auto-tracing an image with much less detail, smoother shapes and fewer colors on the edges. The medium detail level is a much closer to the bitmap version but still there are tiny traces of broken edges- around 5% – 10% compared to the low level detail trace. The colors and shapes inside are smooth and it does not have too many corners. This also indicates that there would be less segments and nodes or anchor points. The High Level Detail trace appears remarkable, and the result absolutely blew my mind. I was actually surprised to see how the shape details remained smooth and intact. Undoubtedly, the resulting vector is the closest it could get to its original Bitmap. You too would agree if you look closely at the spots where any other application would lose its smoothness. Now let’s check out the rest of the features to further improve our result and review Vector Magic. 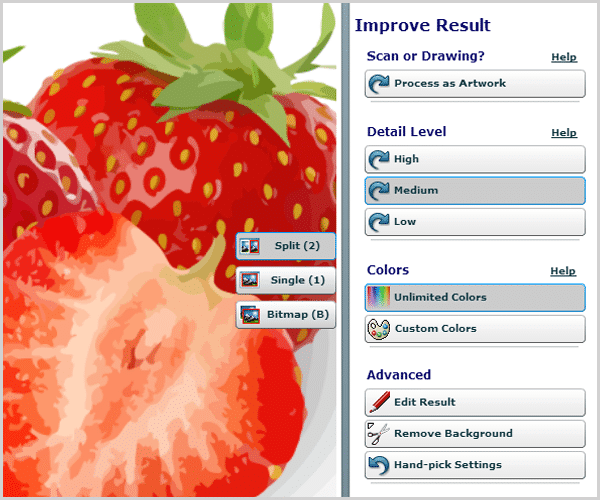 Unlimited colors is the default setting where Vector Magic chooses the a wider range of colors to replicate the Bitmap. 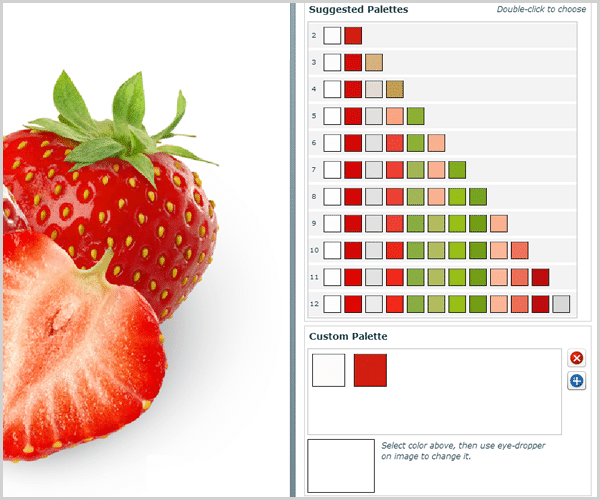 Custom Colors again has a clean interface where the user could choose the range of colors for the resulting Vector and also edit the colors if required. I found this option particularly useful. I could easily navigate the interface and choose colors of my choice. Loved the results too. This option is ideal for tracing out logos with minimal colors. 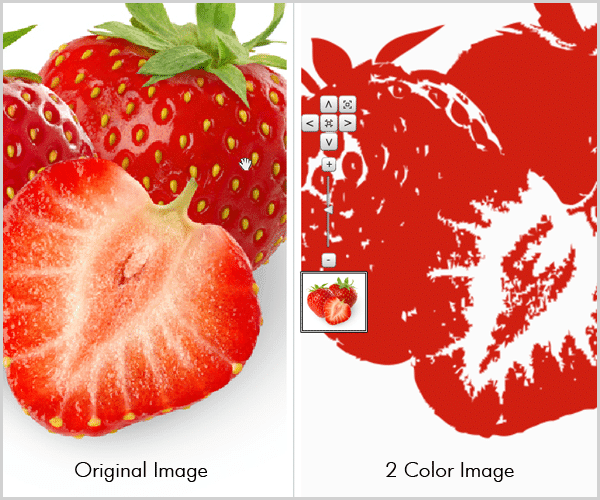 Edit Result in the advanced options reveals some great tools to further enhance your vector. 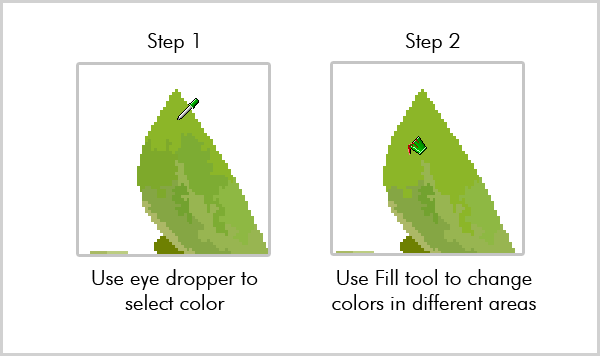 You can pick colors, fill areas with new colors and even redraw certain parts of the image if needed. I have used the fill tool to fill in the colors and the pen tool to fill in the empty areas. These tools can come in handy if you’re aiming for picture perfect Vectors. I would have loved to check-out the delete background feature, but unfortunately its only available on the desktop version. Minus points for that. The last feature set available for further fine tuning your Vector is the ‘Hand Pick Settings’ where one could choose from some very useful settings. 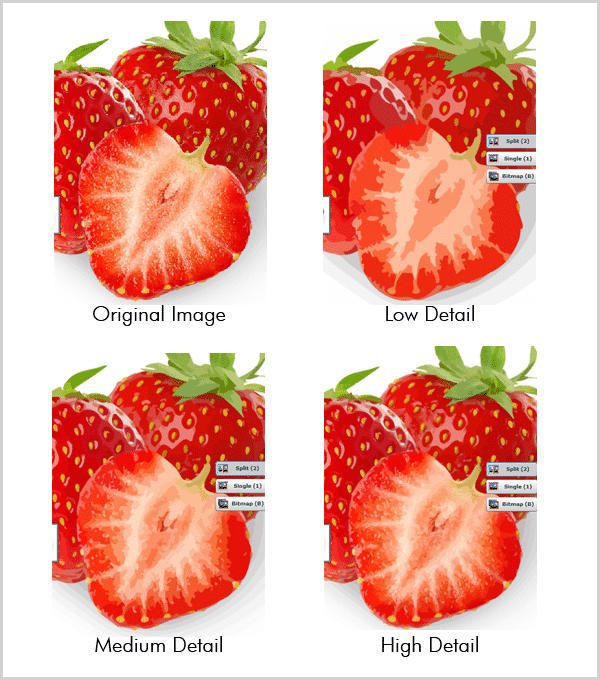 If you have artwork that has been created in a Raster application with anti-aliased option turned on or off, you can choose from the kind of result you desire. Though the recommended ‘Photograph’ setting does a good job and I don’t mind sticking to it. Once done, you can download the resulting Vector in various Vector formats such as EPS, SVG and PDF. Moreover you can also download a PNG version as well, though I doubt if that would be needed. That’s all. 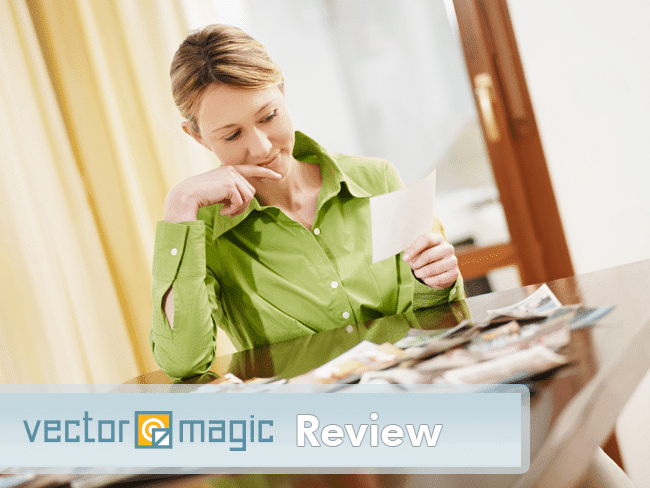 Now that we have seen the features extensively, let me quickly round up the entire experience of Vector Magic Review. Undoubtedly the User Interface is fairly intuitive and I never needed to look through the help option even once. Recommended settings are set as default everywhere, so that a novice wouldn't have to worry about getting the settings right. The upload and download speed as mentioned earlier is amazing. I happily would rate this 4 out of 5. Though I personally would argue about every node or anchor point in a Vector trace, I sure loved the result. But I still would like to take the Vector into Illustrator for a final tweak. So I give it 4 on 5. It costs $7.95 per month for the online version with unlimited usage, and $295.00 as a one-time charge for desktop version. I would go with the online version unless I am tracing loads of images in a day. Okay, I am already considering it as an option so I don’t mind giving it 3 on 5 for this. Why the minus two points? Because, firstly they do not have the ‘remove background’ option in the online version, and secondly because I love free stuff. This further reminds me, that you get to try Vector Magic for Free. Yes! Go on and give it a try. I hope you found this Vector Magic Review useful. I would love to know about your experience with Vector Magic. And why not check out some Adobe Illustrator Alternatives to play with your newly created vector? We would love to share this Vector with you for Free. Enjoy! Would be nice if you compared the output to the Corel and AI autotrace programs. True, maybe we do this in our next review update.